Today in Paris, Belgian designer Raf Simons showed his first ever women's collection under the Christian Dior name. Dior, which had languished for a year without a creative director following the hasty firing of John Galliano (for that whole "being a racist" thing), hired Simons just after he was let go from Jil Sander, a house he had all but made his own. So: this haute couture collection is Simons' first Dior women's wear. How'd he do? Princess Charlene of Monaco took in the show, flanked by the father-and-son pair of Bernard Arnault and Antoine Arnault, the Dior parent company, LVMH, and the head of corporate communications for Louis Vuitton, respectively. To the left of Antoine Arnault is Natalia Vodianova, the Russian supermodel he's been dating. An unusually high number of designers were invited to the show, and some — most notably Marc Jacobs — were good enough to come despite having been themselves in the running for the Dior job. Also in attendance were Diane von Furstenberg, Olivier Theyskens, Riccardo Tisci, Azzedine Alaïa, and Christopher Kane. Karl Lagerfeld was a no-show. The collection had a strong 1950s feeling. The show started off with mostly black and grey looks. Before delving into midnight blue and, eventually, color. The 1950s shapes were consistent throughout: pointy busts, tiny waists, full skirts and padded hips. There were also a number of looks that combined cropped cigarette pants with mini-crini tops — a silhouette that seems likely to confound many body types. The collection as a whole was, with its mid-century references, redolent of the work Simons had been doing in recent seasons at Jil Sander — only completed in couture textiles, with couture embroidery and couture construction techniques. This makes sense: LVMH hired Simons because they liked his existing aesthetic, and Simons is above all a steady designer who has never before gone in for the kind of season-to-season reversals that other practitioners of the profession (like Jacobs) use to keep 'em guessing. Maybe this collection doesn't have the over-the-top glamour of a Galliano couture show, but the work is solid and there's plenty there for an engaged viewer. DVF gave it her seal of approval. 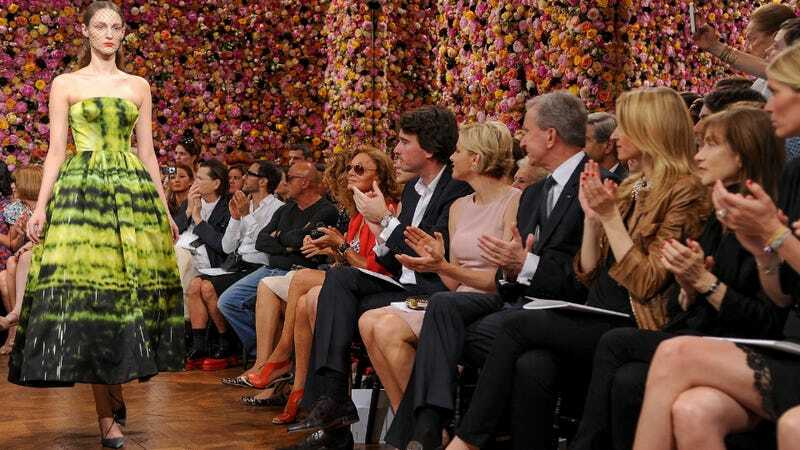 "Raf Simmons did a SUPERB Dior show !" she Tweeted. "Very DIOR ! Another talented Belgian ! Love Diane."